This film got a dishonorable mention on the Worst of 1998 list. "The Man in the Iron Mask"
"Freely adapted" has become the mantra of Hollywood scriptwriters determined to take a fire ax to literary classics. Douglas Day Stewart freely adapted "The Scarlet Letter" in 1995 and it became a disastrous Demi Moore vehicle with a happy ending -- the most blatant example of this phenomenon. 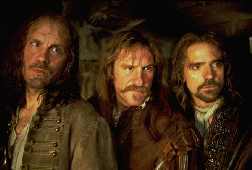 Nearly as bad is writer-director Randall Wallace's middle-aged Musketeers re-working of "The Man in the Iron Mask," a flimsy, cumbersome, obscenely melodramatic take on Alexandre Dumas' 1850 adventure novel. Starring Jeremy Irons, John Malkovich, Gerard Depardieu and Gabriel Byrne as retired Musketeers who attempt to overthrow tyrannical King Louis XIV in favor of his imprisoned twin brother, the film has a lot in common with the embarrassing "Scarlet Letter." Respectable actors make fools of themselves in flavorless roles, wild liberties are taken with the story (D'Artagnan is doing the queen) and oh, that flavor-of-the-month casting -- Leonardo DiCaprio plays rotten King Louis of France. A capable actor when he's well directed, here DiCaprio can't seem to wrap his mouth around the unnecessarily flowery period dialogue. He screws up his face in attempted sincerity, but still comes off like a high school jock unenthusiastically reading aloud in Lit. class. Louis has the hots for comely Christine (Judith Godreche, "Ridicule"), the soon-to-be daughter-in-law of retired Musketeer Athos (Malkovich). Not accustomed to competition, Louis sends her finance, Athos' son, off to war so he can die. Enraged and bereaved Athos swears revenge -- and justice for France while he's at it. He gathers his fellow ex-Musketeers and with their help frees the king's concealed twin brother Phillippe (also DiCaprio) from a painfully obvious soundstage dungeon, give him a make-over and start training him to replace the king. Director Wallace, whose only previous film credit was the script for "Braveheart," has little control over his actors and lathers the film with cheap symbolism, contrived plot devices and 17th Century street urchins from central casting. The whole idea of balding, paunchy Musketeers who get winded just picking up their swords smacks of a bad TV movie flung into theaters by the sheer marquee power of its cast. But Irons, Byrne, Depardieu and Malkovich just aren't up to the task. None of them are the swashbuckling type, and without any curbing from Wallace they spend most of the picture climbing all over each other trying to be brilliant and have their moment. Irons is intense but vague as the pious Aramis. As D'Artagnan, the King's guard whose loyalty is split, Byrne doesn't manage much more than a furrowed brow. Malkovich is Malkovich (which is getting very tiresome). And Depardieu needs a dialogue coach -- I couldn't understand a word he said. About an hour into the movie, the Musketeers switch Phillippe for the king during a conveniently scheduled masquerade ball at the palace. Our heroes bonk His Majesty on the head and send the nervous, under-prepared Phillippe out to greet his court, where he is almost immediately recognized as a fraud. Forty minutes of dreary, anticlimactic sword fights ensue until the credits roll. With Leonardo DiCaprio running around in frilly, plumed hats and manly actors throwing cheek kisses around, this picture is ripe for parody and "Saturday Night Live" would be remiss not to tear it to shreds.